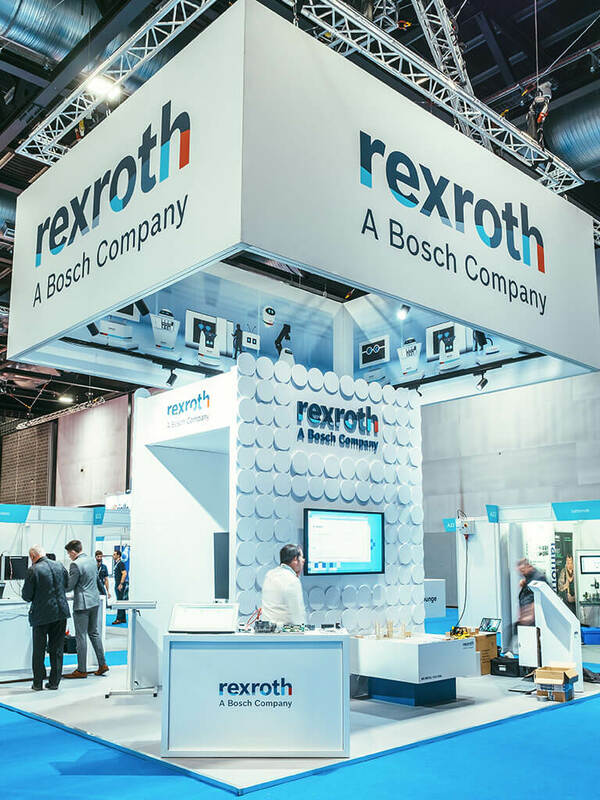 Bosch Rexroth is an engineering firm based in Lohr am Main in Germany. As a global partner, Bosch Rexroth supports mechanical and plant engineering challenges around the world with its cutting-edge technology and unique industry knowledge. 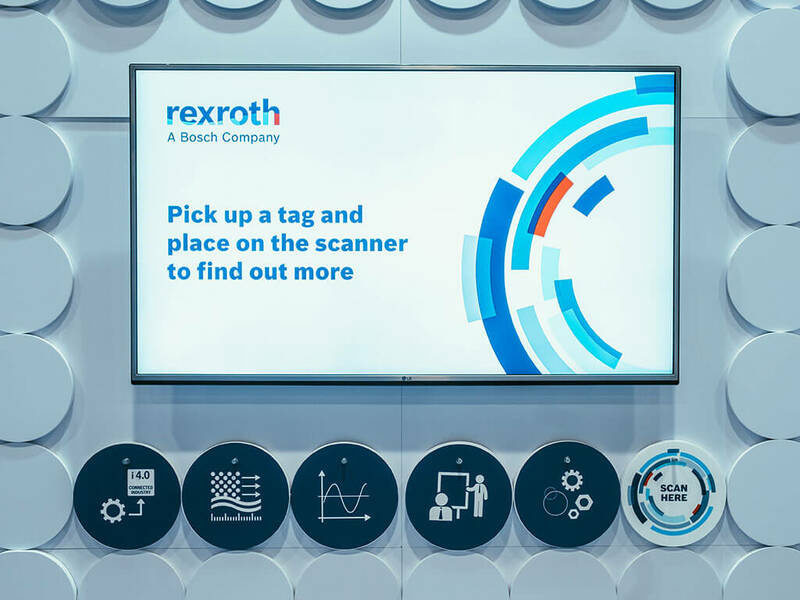 In terms of events, Bosch Rexroth came to Nimlok with the challenge to showcase their capabilities and innovations in the smart factory industry. They also sought to convey a strong new brand evolution with a stand that could be re-deployed over multiple events. 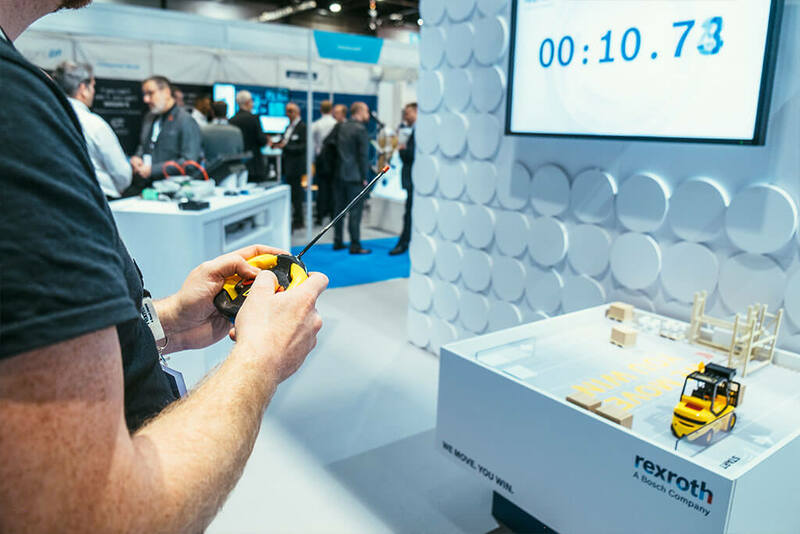 Bosch Rexroth’s innovations touch many parts of a smart factory environment, so Nimlok’s engagement team developed a driving game challenge using customised remote forklift trucks to drive visitor interaction. The trucks were driven around a smart factory maze and passed over RFID hotspots during play. This triggered content designed to highlight the breadth of Bosch Rexroth’s product applications. Player results were timed, giving a competitive edge whilst the prominent game placement and live video relay screens drew stand footfall. We created a design which was based around 65% hired stand architecture. This allowed the stands to be rebuilt in a wide array of different configurations without excessive inventory investment. Bespoke elements, including the brand themed textured wall, delivered a high-end custom look. This approach versus traditional custom build alternatives delivered on budget without compromise on design, and enabled the investment in engagement tools. The end result was a striking stand that was also effective. Our engagement team also created and deployed interactive case studies and a coin activated survey to stimulate conversation about the financial implications of their work. The combination of three distinct engagement features ensured Bosch Rexroth’s team, secured more of the exhibition attendees time than their rivals. 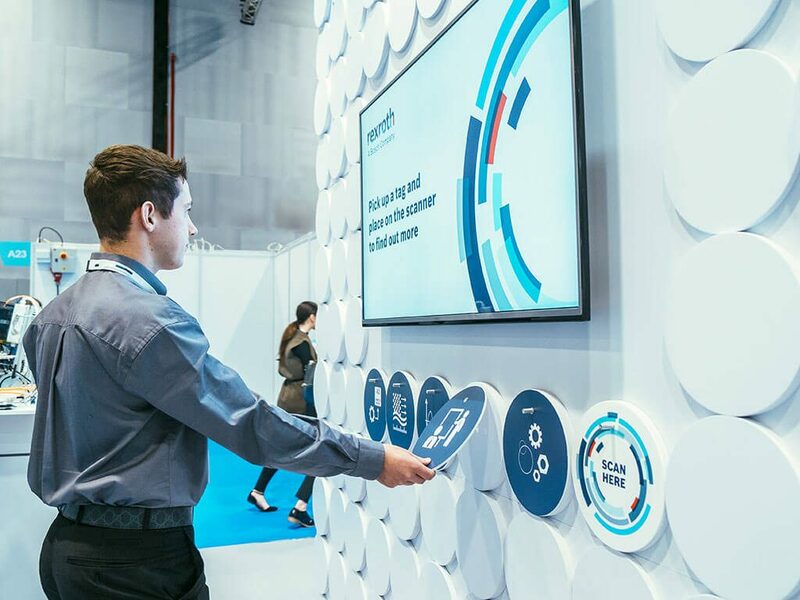 The stand attracted over 1600 visitors with an average engaged dwell time of 9 minutes, providing the team an opportunity to raise their brand profile, deliver memorable experiences and lay the foundations for post event meetings.